Style 1) Tapping - to produce a tapped hole in hardened or difficult-to-machine materials. Style 2) Molding - to EDM split cavities for injection molds & die cast dies. Our electrodes are made from high quality POCO-3. 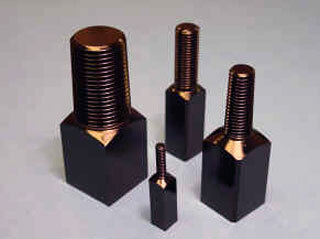 The threads are timed with the square shanks allowing roughing and finishing with multiple, identical electrodes. Tapping electrodes stocked for immediate shipment. Let Kelbros Inc. take your uncertainties out of threads!